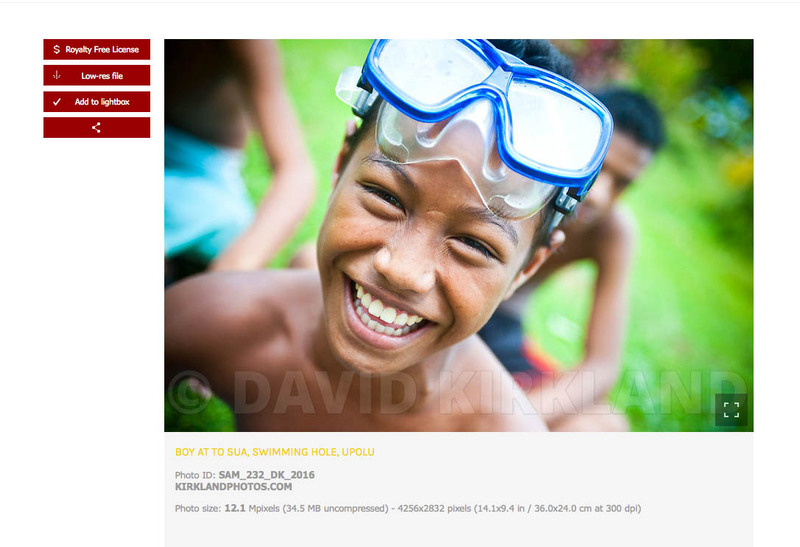 Following is a simple eight step process to order your photograph or photographs on-line. STEP 1: Click on the thumbnail image you are interested in and review it as a larger display image by clicking the Low-res file panel next to the photo. Panel 1 - Click this panel to view the cost of the photo - either as a Royalty Free Image or a Rights Managed Image with usage calculator. Panel 2 - This panel allows you to view a low resolution version of the image on your desktop or device. Panel 4 - The panel at the bottom of the column allows you to e-mail the image or share it on social media. STEP 2. 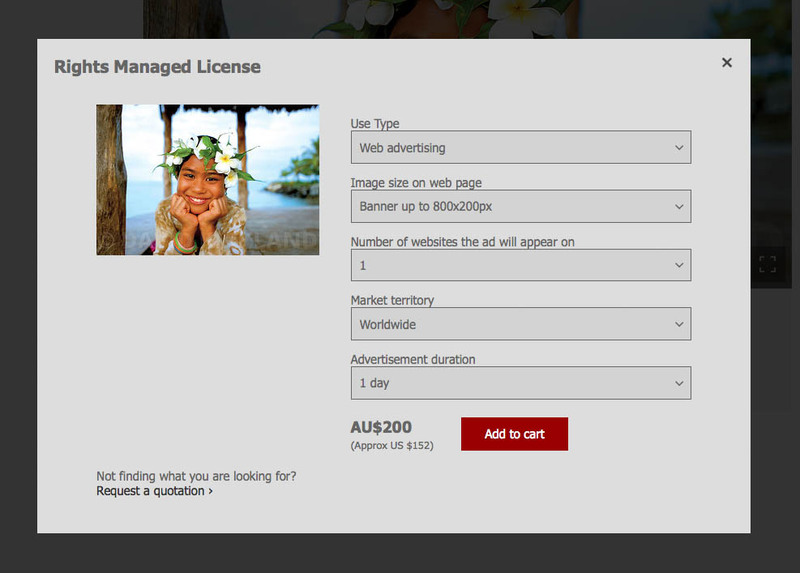 After reviewing the low resolution file, click the License panel at the top of the column (Royalty Free, Rights Managed or Exclusive). 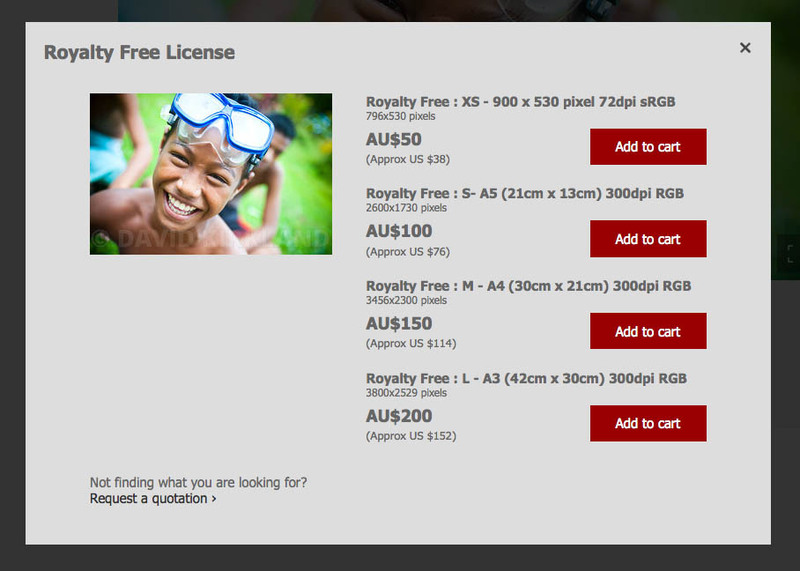 A box will appear next to the photo, asking you to chose the size you want, with the image release fee indicated. STEP 3: Click Add to Cart to the size you want. Royalty Free. Most of our photographs are Royalty Free which means they come at a standard rate, however, if you want to purchase a prime Rights Managed Image, you will need to use the simple drop price calculator on the right-hand side of the photograph to get a quote. 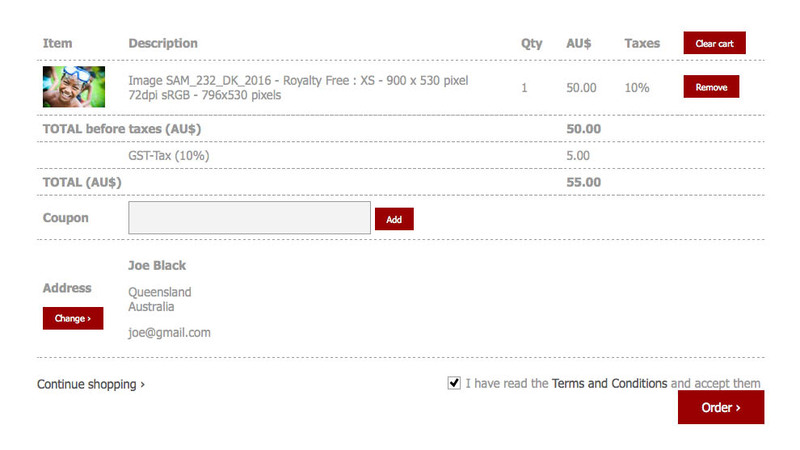 Again, simply click the Add to Cart Panel at the end of the process to add it to your order. STEP 4: You will be asked if you want to continue shopping. If you want to consider more photographs from the gallery you’re in, simply close the box and click the destination name on the top left-hand side of the screen. Go back to Galleries if you want to chose from another gallery. Lightbox: (Only available if you have registered an account) If you want to collect photographs to consider them as an overall package, just choose the photographs and click on the Lightbox panel on the left-hand side of the photograph. You can click as many photographs as you want or create as many collections as you want, however, you will be asked for your details and a password to set up your own Lightbox for convenience of access at a later date. 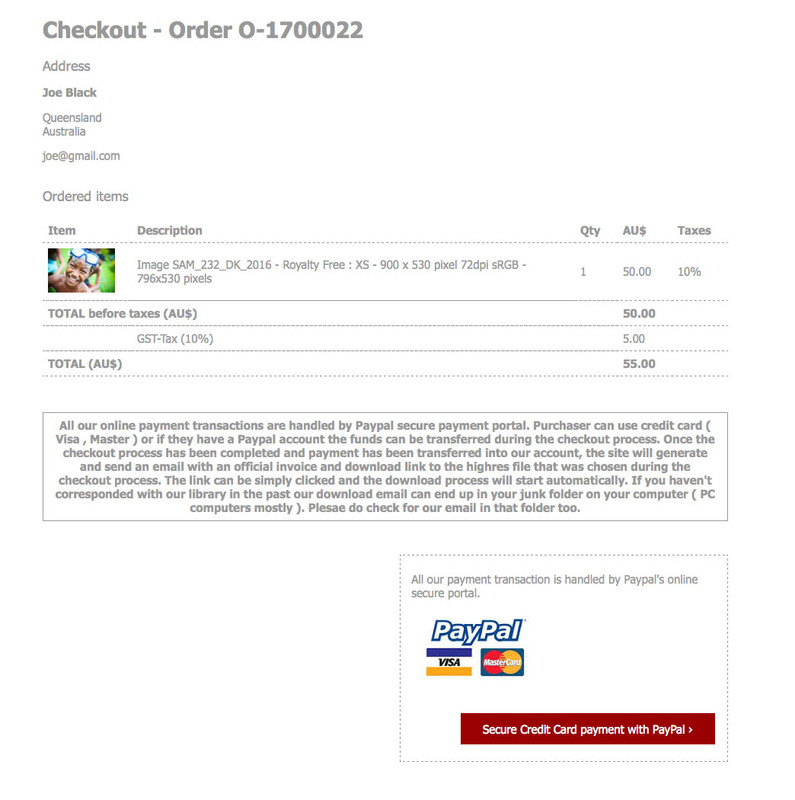 STEP 5: Once you have selected the last of your photographs, click View Cart and you will be taken to a preview of your order. At this point, you are still not obliged to buy anything and you can remove photographs from your selection, go back, or change the size/usage of the photographs you have selected. Discount Coupon. It is at this point you can enter in the details of your discount coupon if it has been issued to you by us as part of a Special Package or Promotional offers. The discount will automatically be applied to your order, leaving you with the balance to be paid. STEP 6: Proceed to the checkout. 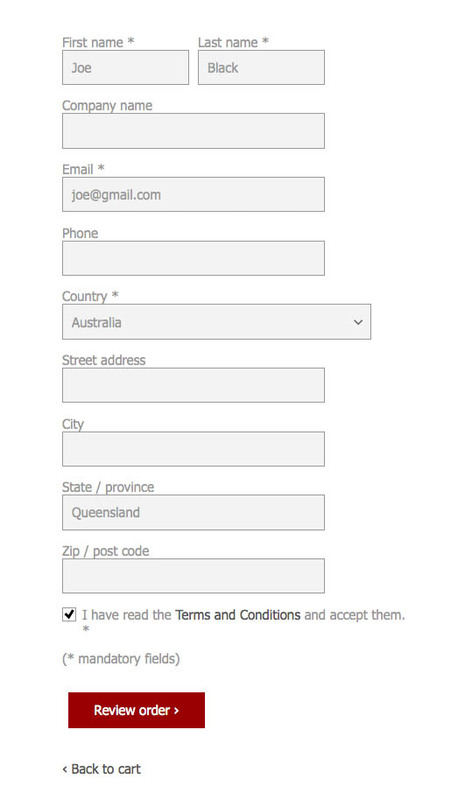 STEP 7: Enter your details if you have not already done so which will allow the photographs to be sent to you as soon as payment has been received. Once again, you can change any details or choose not to proceed at this point. We recommend you pay through the secured Paypal portal if you have a Paypal Account. STEP 8: Click on the box that says “You have read the terms and conditions and accepted them.” Then click to place your order and go to Paypal’s secure payment portal. Once you have paid, an email will be sent to you confirming your payment. A separate email with follow shortly after with the image download link. Just click on this link and the photograph/s will be downloaded to your desktop or device immediately.